kitchen had coffee maker,toaster fridge &2 rings,no kettle!there are plenty of supermarkets around to stock the fridge.rooms were cleaned 5 times but sheets not changed all week,large bedroom & 2 sofa beds,plenty of storage.safe was 15euro(5 returned).hotel right on beach at bottom of strip.swimming pool was like an ice bath but sea was really warm.staff were friendly enough,we didn't watch much of the entertainment but it was the usual holiday stuff.we would definatly visit this hotel again. Location fantastic right on the beach all rooms have sea view, hotel staff very freindly, room cleaned I think five times a week. Fine hotel in every way exept for a lack of airconditioning. Clean, the swimminpool with clean water, something we have encountered othervise elsewhere, nice pepole at the bar. This hotel is situated on the beach and approximately 50 metres from the small town. There are plenty of restaurants, takeaways ( including Pizza Hut, Kfc) shops and bars within a short walk. The hotel has a half board option that you can book whilst there. The staff were really friendly and helpful. The bar staff, Jose, Manuel, Mateo, Rosi and Jeffery ( real name Patiko ) were fantastic.. There is a hotel run kids club, Sophia and Mikele are the entertainers for kids of all ages!! They were always full energy. Our family has been visiting Alcudia for the last 14 years and love it. 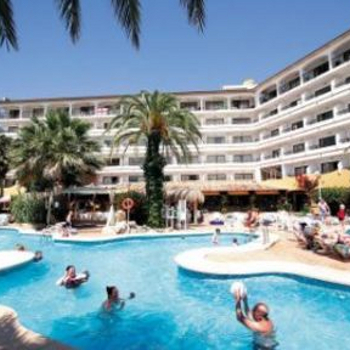 We have been to many different hotels within the resort but Paraiso De Alcudia is certainly the best and have been going there the past 2 years. Unfortunately in 2005 we arrived and found out that the place was full of All inclusive members from the Jupiter/Saturno hotels as they had been fully booked. This lead to the pool area being full and fighting for sunbeds. We would go back again but this year it has been over-priced so are opting for another hotel. My husband and I stayed here in August 2004 with our 9 year old son. The apartments are right on the gorgeous beach, and were spotless. The view from all of the balconies was wonderful.